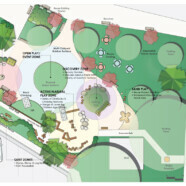 New Discovery Garden Park open in McFarland | Vandewalle & Associates, Inc.
MCFARLAND, WISC. Adjacent to the E.D. Locke Public Library, McFarland has a newly reimagined park space designed to spark kids’ creativity and inspire interaction with textures, sounds, scents, and multi-sensory activities. Designed by the Vandewalle & Associates design team, the park is now open to the public. You can see a Google Maps image here.